Many in the general public expect scientific and technological innovation to bring helpful change to society. Yet, when Americans are asked about the potential use of emerging technologies that could push the boundaries of human abilities, they are far more cautious about the morality and effects of these advances. A new Pew Research Center survey examined public attitudes about the potential use of three emerging technologies that could fundamentally improve people’s health, cognitive or physical capacities. The specific examples: gene editing to give healthy babies a much reduced risk of serious diseases and conditions over their lifetime, implanting a computer chip in the brain to give a healthy person a much improved ability to concentrate and process information, and a transfusion with synthetic blood to give healthy people much improved speed, strength and stamina. 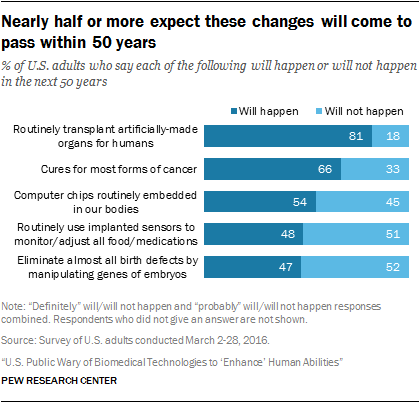 1 While the public expresses more worry than enthusiasm about human enhancements, most expect many enhancements will happen within the next 50 years. Fully 81% of U.S. adults expect artificially made organs to be routinely available for transplant by the year 2066. Roughly two-thirds (66%) of Americans say scientists will probably or definitely cure most forms of cancer within 50 years. None of the techniques that anchor this study are available for enhancing purposes today. But many people foresee a future where each would be commonplace. Roughly half of adults (54%) think the idea of implanted computer chips is likely to be a routine occurrence in the future. Some 48% say humans will definitely or probably use implanted sensors to monitor or adjust all food and medications that enter the bloodstream by the year 2066. And a similar share of adults, 47%, foresees a future with almost no birth defects because of genetic modification of embryos prior to birth. 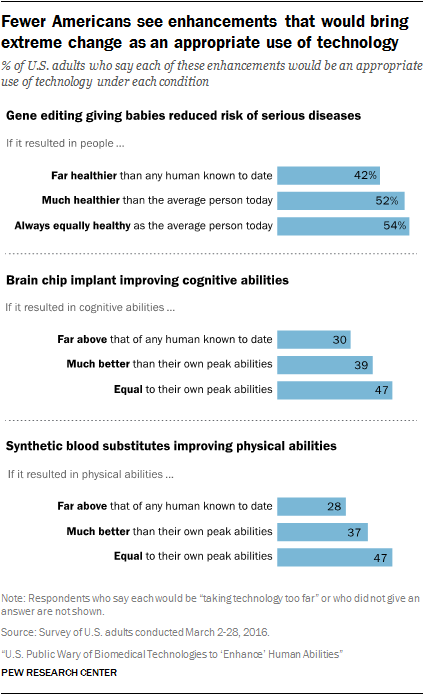 2 Most Americans say they would not want to improve their cognitive or physical abilities with brain chips or synthetic blood. For all the potential appeal of having sharper brains and stronger and healthier bodies, about half or more of Americans say they would turn such options down. Roughly two-thirds (66%) of the public says they would not want an implanted device giving them a much improved ability to concentrate and process information, while a third (32%) say they would want such a device. The same is true when it comes to synthetic blood substitutes for improved physical abilities. Some 63% of adults say they would not want this, while 35% say they would definitely or probably want this. 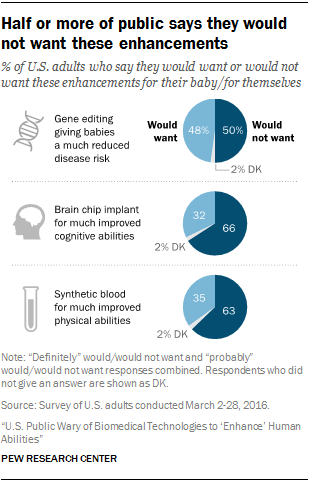 The public is closely divided over gene-editing to significantly reduce their baby’s risk of serious diseases and illnesses: Roughly half (50%) say they would definitely or probably not want this for their own baby and about the same share (48%) says they would. 3 Religious Americans are the most wary about future human enhancements. On balance, Americans who are more religious are less likely to approve of these potential enhancements. 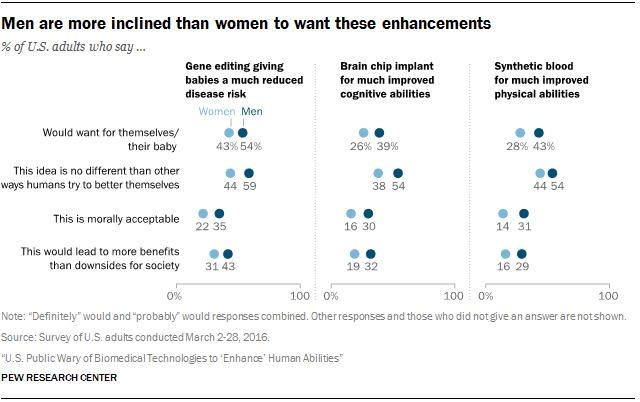 And people with high religious commitment are less likely to want these potential enhancements for themselves or for their baby. More religious Americans are also more likely to see these potential enhancements as “meddling with nature” and crossing a line that should not be crossed. 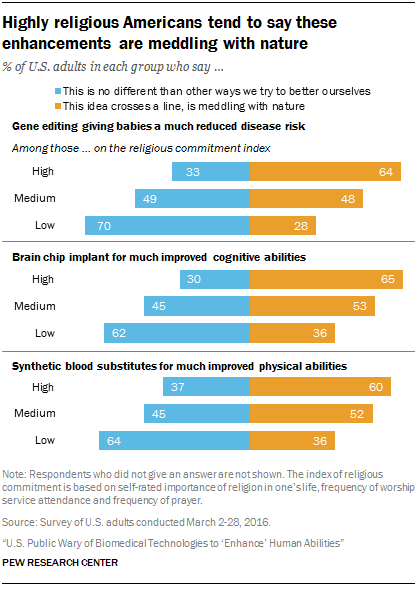 By contrast, majorities of those low in religious commitment say each of these potential enhancements is in keeping with other ways humans have tried to better themselves over the centuries. 4 The more extreme an enhancement is, and the more permanent any change is, the less likely people are to embrace it. For example, while 47% say it would be an appropriate use of synthetic blood substitutes if it results in improvements equal to their own peak abilities, just 28% of adults say synthetic blood substitutes resulting in speed, strength and stamina “far above that of any human to date” would be appropriate. People’s reactions to these enhancements are more positive if the effects are controllable or temporary. About half (51%) of U.S. adults say a brain chip implant would be less acceptable if the effects on cognitive abilities were permanent and could not be reversed. 5Men are more positive than women about possible future human enhancements. More than half (54%) of men say they would want gene editing to give their baby a much reduced risk of disease, compared with 43% of women. Men also are more likely than women to say each of the enhancements in the Pew Research Center survey is similar to other ways in which humans have tried to better themselves. By comparison, women are more likely to see each as “meddling with nature” and crossing a line that should not be crossed. Men and women are about equally likely to expect at least some change for society from these potential enhancements, but men are more inclined than women to foresee each as bringing positive effects. Despite the fact that most adults see future social inequality tied to unequal access to these human enhancements, there are surprisingly few differences in assessments across racial and ethnic lines, education or income levels. 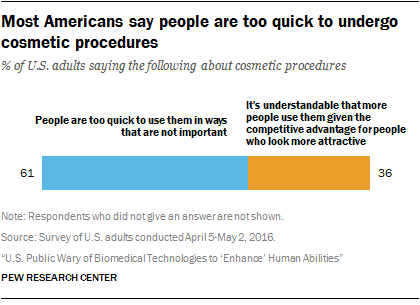 6Many Americans have mixed views about current enhancements, such as cosmetic surgery. For comparison, the survey included questions about several enhancements available today: elective cosmetic surgery, laser eye surgery, skin or lip injections, cosmetic dental procedures to improve one’s smile, hair replacement surgery and contraceptive surgery. When it comes to views about elective cosmetic surgery, in particular, 34% say this is “taking technology too far” while 62% consider cosmetic surgery to be an “appropriate use of technology.” Overall, 54% of U.S. adults say elective cosmetic surgery leads to about equal benefits and downsides for society, while 26% express the belief that there are more downsides than benefits. Just 16% say there are more benefits than downsides for society from cosmetic surgery.